When is the last time that you paid close attention to your social media efforts, beyond posting on Facebook and Twitter? The years go on, with daily postings of blogs, photos and videos, and we lose sight of some of the housekeeping that should be done to keep our spa social media brand updated. Let’s face it, social media is fun and easily accessible, but it takes work, time and money. Spring is the perfect time to drill down in your social media and cast off what’s not working and grow what is. There are some general best practices that should be executed on an annual basis in regards to your social media presence. Look at all your social media channels and ask “Do I need this channel?” Nothing is more unprofessional than someone visiting your Twitter account or Facebook page and the last time you posted anything was years ago. The message that you send, is that your business isn’t important. How relevant are the channels to your spa business? Not all platforms work with all businesses so there’s no need to maintain accounts that do not bring in clients. Ask clients to follow you on Facebook ,Twitter or Pinterest for special incentives and promotions through your marketing efforts. Pick 2-3 channels that you will commit to posting on a regular schedule. If it’s posting 4x a day on Twitter and 2x a day on Facebook, make it happen. If you do not have the time, hire someone. Consistency is what you are striving for. Align your social media channels to your marketing goals and leverage the opportunity within each channel. Use Facebook advertising or push promotions through Twitter, that is what they are there for. Is the social media mix you have chosen worth your time? Does it attract new spa clients? Using Google Analytics is a great way to measure your social media impact. Update Information: Visit all your social media channels and make sure that all your company information is correct. Hours of Operation, phone, email, add social media follow links where needed. Update your company profiles with newer information. Image Refresh: Change your company pictures and profile descriptions. Don’t let your image look old, keep things fresh and current with a new image. Change backgrounds and profile pictures as well as delete images from Facebook/Twitter that are old and have no relevance. Consistency: All your social media channels should look and feel the same. Your logos, colors, image should be consistent. Administrative: Who has access to your accounts? Maybe an employee that is no longer with you? Look at all the administrative access/permission to your channels to protect your business, remove and edit as needed. These exercises should not take much time, think of them as business insurance. Maintaining your brand online and in your spa is a continuous effort that requires time and energy. If you do not have time or ability, reach out to a specialist that can help. Looking for other ways to keep your spa in tip top shape? 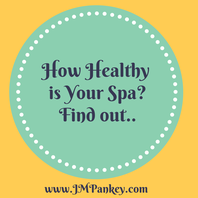 Give it a check-up with our Spa Health Calculator. Click below to use this helpful JMPankey Partners app!